A partial record of 3 months, October through January, spent mainly in Sydney. The record of the trip started out as an extended "blog," but I decided in 2004 to edit it down and rescan the best of the images, partly because I went back to the sketchbook in order to repaint some of them in oils. For me as a painter, the value of the trip was in spending so much time in an oil-painters' country, where the light and the colours really lend themselves to media other than watercolour. Late October: Walked across the Harbour Bridge from the tiny apartment we had rented on Kurraba Road in Neutral Bay, to Observatory Point (the park in front of the National Trust headquarters) and daubed the famous bridge looking across the Rocks toward the North Shore. Early November: Our daughter Sarah Jane's backyard in Petersham, with Hill's Hoist and laundry, and baked brown grass, at dusk on a warm spring evening. November: From the sketchbook, a steep pathway and set of stairs down to Lavender Bay, passing a National Trust-classified Victorian house from the 1880s. The McMahon's Point ferry wharf is in the middle distance. November: We spent a couple of weeks in the country, most notably at a house in the remote Mount Wilson part of the Blue Mountains belonging to Christine's stepbrother. Along its winding driveway were tree ferns and several "Mountain Ash" eucalypts, their pale trunks criss-crossed by the blue shadows of the long strings of bark. Eucalypts are such messy trees, leaving a huge pile of bark and leaves on the ground throughout the year and providing fuel for the bushfires that regularly ravage the area. November: Blue Mountains landscape (west of Sydney). The Horseshoe Falls near Govett's Leap at Blackheath. Every square metre clothed in grey-green eucalypts, except for the sheer rock faces. The blue of the Blue Mountains, which tints the shadows and "mists" the distant views, is apparently caused by the action of sunlight on the eucalyptus oils (a sort of New World sfumato). These are the Australian landscape colours, which are both dull and bright at the same time. Scenes like this really look best in oils, which can communicate the thick intensity of the light. John Atkin gave me one of his beautiful hand-bound books, size approximately 6 1/2" x 4", which I filled with "croquis"
Clockwise from top left: a pub on Broadway; ibis on the prowl; Harbour Bridge from the North End (d'après Grace Cossington-Smith); Avalon Beach and Barrenjoey Head; Moreton Bay fig tree in the Botanical Gardens; men at work on the Harbour Bridge; fruit bat and palm tree; a wedding party at the Observatory. December: A house on the far side of the Brisbane River (view from the aunt and uncle's apartment) -- classic Queensland architecture all of timber, built on stilts to keep the white ants from destroying the foundation, with open balconies to catch every possible breeze. Temperature in the mid 30s, palm trees gently swaying. December: for a week before school holidays began we rented a cottage named "Snapper Shack" in a national park reserve at Pebbly Beach, about 5 hours south of Sydney by car. A rustic cottage with a rainwater tank and solar-powered lights, semitame kangaroos and parrots everywhere, and a beautiful beach a few steps away. The rock pools at low tide (right) were endlessly fascinating, the abstract patterns and bright colours of sand and shells very reminiscent of the motifs of aboriginal art. December: Braidwood is a New South Wales country town about 4 hours south of Sydney and an hour inland, so historically significant it's classified by the National Trust. We'd wanted to visit it ever since seeing the film "The Year My Voice Broke," featuring a then 15-year-old Noah Taylor, a decade or more ago. It turns out it was also the setting for the Ned Kelly film starring Mick Jagger (the 1890 Royal Hotel, the building farthest along the street in the painting, was renamed the Royal Mail Hotel in 1969 for the shooting of "Ned" and the name apparently stuck). The other buildings are classic Aussie country-town architecture of the Victorian era, when the town boomed following the discovery of gold in the 1850s. On Saturday mornings the farmers and stockmen come into Braidwood from the surrounding properties, their utes lining the streets while they do their business and meet up in the pub. For our last six weeks in Australia, we were lucky to rent a good 2-bedroom apartment in Roseville, a Sydney suburb. It had a covered verandah/terrace, where I decided I could set up oil paints and canvases. The two small paintings below survived the experiments, the lower one reflecting our preoccupation with the bushfires that dominated the news from Christmas Day through mid-January. There was so much ash in the air from the fires west of Sydney that it blew over everything, sticking to the wet paint on these canvases. 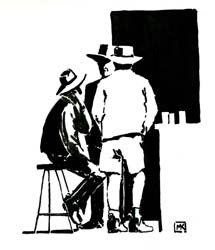 January, 2002: In the 3 months we've spent down undah, largely in the Sydney and Brisbane areas, I've seen no more than a handful of watercolours hanging in commercial galleries. In Paddington and on Queen Street in Woollahra the galleries are full of oil paintings, many of them abstract. Episode 1: even the Australian Gallery of Works on Paper had a show of ceramic sculptures and painted ceramic tiles (of boathouses). "Do you show watercolours?" I asked the attendant. "Well, if there are a few in the show of a major artist, yes, but otherwise not." "But you're 'works on paper'?" I continued. "Prints," she said, waving at racks of etchings. Somehow the subtlety of watercolours is lost completely in a city like Sydney, and the big, bold oils that are typically shown in galleries fit in with the bright light and the rather spare interior decoration in people's places. Episode 2: A juried exhibition of paintings in the public gallery in Mosman, a very tony area on Sydney's North Shore. Most of the pictures were quite large, perhaps 3 feet by 5 feet. Some were completely abstract, others very much in the landscape tradition. All were oils. The winner was chosen by the jury and confirmed by a people's choice sort of a ballot, and had been purchased for Mossman's public collection. Prices ranged from a few thousand to about $20,000. The curator of the gallery was hanging around, so I told her I was curious that there were no watercolours--no "works on paper"--in the show. "We're not really set up to conserve works on paper here," she said. "Yes, but one of the pictures in the exhibition has some newsprint, a clipping from a newspaper, incorporated into it. If it had won how would you have conserved it?" "Yes, that artist is really the only one in the show who's taking any risks. He's quite in demand for public collections now." "But what's the future of a piece of art like that?" "I suppose it's a given that the newsprint part of the artwork will deteriorate and disappear over time." Apparently, she felt that watercolours were the sort of things done by "Sunday gum-tree painters," as hobbyists were described in a sneering newspaper article I read about another art show. "Risk-taking" was more important to her than permanence. Episode 3: in Brisbane, we met the artist Ralph Wilson (who ought to have a website), having seen his large, beautifully painted "traditional" landscapes during previous visits. His muse is Fraser Island off the coast of Queensland, and his preferred vantage point is his boat just offshore. Although he is also painting some still-lifes and a few small pieces, he has been extremely successful with his paintings of the island's white beaches and the tropical forest behind them. We were invited to his studio where I was knocked out by the quality of his oil paintings, and also visited the gallery that exhibits him and saw a wide range of his works, some in real landscape format of about 3 feet high by 8 or 10 feet wide. Very impressive and powerful--very inspiring. Apparently, he is not collected by any public institutions because his work is considered too traditional. Oh well. And, he says, he wants to go back to painting watercolours, at least some of the time, to regain the freedom that is missing for him with his more formal, finished oil-painting technique. Why don't people exhibit or buy watercolours much? I ask him. "I think it's got more to do with the way light comes into Australian homes," he said. "It's very angular and bright, and anything behind glass can be very difficult to see." Episode 4: at Art North, a small gallery in Gordon, one of the affluent suburbs on the North Shore train line in Sydney. The place is chock-a-block full of paintings, mainly traditional landscapes and seascapes of a high standard, with a few little watercolour landscapes hanging here and there. The young man who runs the place tells of a potential customer who very much liked the composition and colours of a watercolour of a sailboat, but asked: "Do you have this as a real painting?" Episode 5: A gallery on Glenmore Street in Paddington, about the fifth in a row displaying mainly abstract, large, bright oils. "It's the look we want in the gallery," the owner tells me when I ask him about representational art or works on paper. "And it seems to be what everyone wants who's in the market for a painting." "I'm curious--do you ever show works that have a specific sense of place? Scenes that would be identifiably Sydney?" "That would appeal more to people who are visiting here than people who live here." Stopped in Darlinghurst on Oxford Street on the way home. Bought oil paints . . . .